And he's not alone, because hot on his heels comes......Jeanne Benoit, a former love interest for Tony. If those weren't enticing enough, the action part of the story took place in South Sudan. 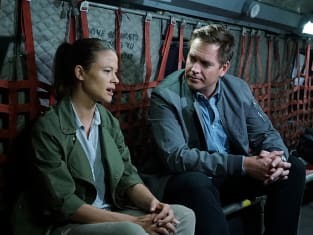 NCIS Season 13 Episode 8 gave us the exciting tale of a hunt for a rebel army group in the Sudan, who had killed three members of a volunteer medical organization (including a Navy doctor) and kidnapped another doctor and a Navy Ensign who was a surgical tech. Gibbs had fully intended to take the lead on that hunt, only he collapsed in the bullpen, mid-planning session. Fortunately, Dr. Taft was there to provided medical help, get him to the hospital and most importantly, confine him to his home. This gave Tony the lead over in the Sudan. It also left Bishop on point back at NCIS, something she hadn't anticipated or even recognized until Ducky pointed it out. You have to love it when the writers shake things up like this! This entire story felt like a "back to our NCIS roots" episode: it crystallized some of what the service is all about, and highlighted the fact that not all of their work is done stateside. It is so good to see Dr. Taft back in the mix, isn't it? Other than Ducky (who rarely argues with him), Taft is the only one willing to go head-to-head with Gibbs, and get away with it. Though Gibbs grumbles a lot, he recognizes Taft's integrity and caring, and he seems to respect it, in spite of himself. The fact that Gibbs actually asked Taft about how he dealt with the death of his son, and the fact that Taft was willing to open up about it, cemented their relationship. Taft is not just another colleague and he's not just another doctor. He's now a confidant and a friend. Taft's logic as to Gibbs' panic attack (or whatever it was) seemed sound and logical. Anyone shot like that is likely to have psychological baggage to which he'll have to attend, whether voluntarily or through physical reaction. Gibbs is so stubborn that it took a second near-attack for him to finally bite the bullet and seek Taft's help. That's consistent with Gibbs' character. Now it remains to be seen what will be the outcome of Gibbs' visits to Taft. He's got a lot of talking to do, and so the guess here is that he'll end up making some hard decisions along the way. One thing that was hard to miss: Gibbs seems to be feeling the effects of what it must be like to get old. And like a number of older people we may know: it's no fun being grounded, for anyone. For Gibbs it's just pure torture. There is a huge bright spot in this episode: for once we didn't have to revisit Tony the Clown or McGee the Whiner. That was gratifying to see. McGee: So when are you going to go talk to her? Tony: There's nothing to talk about. I'm sorry about what happened, but I was doing my job. That's it. Of course it bothered me that I lied to her. I was in love with her. But it was a long time ago and her husband is missing and there's nothing to talk about. Permalink: So when are you going to go talk to her? McGee's support for him on the trip home, when he said Tony could drop the guilt now, was warm and brotherly too. I hope we see much more that side of McGee in the future. 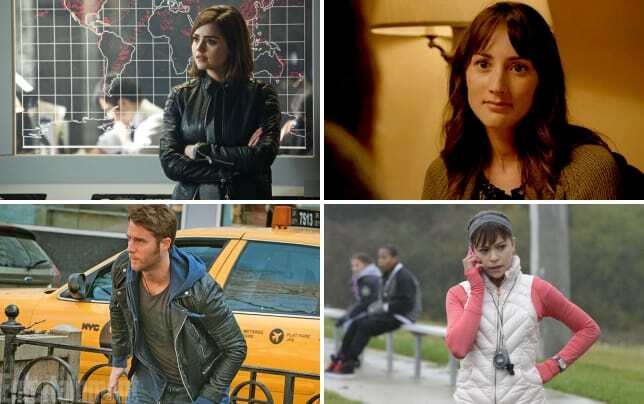 Tony's closure with his ex-girlfriend probably meant more to those who've seen the series from the start – or at least from Season 4 – than the rest of us. That one key flashback pretty much said it all though: Tony denied his own feelings so that he could tell Jeanne that there was nothing between them. And he did so, knowing it would hurt her. That shows a level of professionalism and commitment above and beyond the requirements of duty. And it highlights the fact that Tony is an NCIS agent through-and-through. In that clip he showed himself to be a leader, dedicated to the mission at hand. Still though, it left a mark. And it leaves a question: what's up with Zoe and him these days? We know it's not going well between them. So hopefully we'll get a peek at what's going on with them soon. This was one of the best episodes so far this season. Other than the fact that Taft talks a lot (which seems to be vintage Cryer, in whatever role he plays), there wasn't much to be found wrong with it. We now know the secrets to escaping the zombie apocalypse: feed some poison into the soles of the recently dead's feet. Never mind that there's no circulation going on: that's just a pesky detail. Wish we could have seen more of that amazing attack helicopter. On the other hand, it did take care of business pretty efficiently. Does anyone else wish they had a fireplace just so they could try out the cool barbequing deal that Gibbs did? 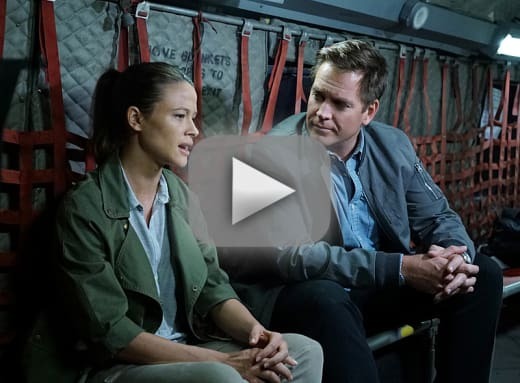 You can see this show again when you watch NCIS online. What are your thoughts on this episode? Be sure to chime in, in the comments below. And be on the lookout for our Round Table discussion later in the week! McGee: It's gotta be weird for you on some level. Tony: Yeah. I think the word is totally surreal. All of it. The truly weird part is, I'm happy for her. McGee: You should be happy for yourself, too. You don't have to carry around all that guilt anymore. Taft: What are you afraid of, Gibbs? Taft: Cut the crap. Life threw you a major league curve. You get a lot of support but at the end of the day, when your head hits the pillow, it's just you. Admitting at least that much might be half the battle. Everybody's afraid of something. Even the great Leroy Jethro Gibbs.